Mauricio Pellegrino’s Southampton haven’t enjoyed the successful season Saints fans would have hoped for. Their poor season has largely gone unnoticed. The Saints currently sit 22nd in the Premier League with just 22 points from 24 matches. However, the relegation battle this season is tight. And more interesting that the title race which ended in October. There are just eight points between 9th place Everton and last place Swansea. A win for Southampton could move them up to 12th. So, although relegation is a real possibility a small run of form would see them rise the table rapidly. Whereas Spurs occupy 5th spot. I win in this match would have seen them move ahead of Liverpool, who lost to Swansea on Monday. Both Liverpool and Tottenham lost vital points needed in the battle for Champions League qualification this gameweek. Here are some of the key points in the match. Tottenham deserved to win the match off of the chances they created. Southampton played a relatively low block, limiting Spurs. Mauricio Pochettino’s side were often static in attack with few options. Southampton sat deep and packed the box. Happily leaving Spurs with lots of space on the outside the penalty area. As you can see in the gif above, Southampton have 8 outfield players in the box. Dier received the ball on the outside of the penalty area. He isn’t pressed and Southampton players sat off. Dier had no attacking options and ends up shooting from range. Aurier is left with a lot of space out wide. Here Aurier overlaps and crosses to the back post. He gets in a wide area and is quickly closed down. Sissoko was slow to react and move into any space. 7 Southampton outfield players are facing the 4 Spurs players. Spurs were often limited to crosses and get the ball in wide areas. Aurier had very little option here but to cross and Tottenham were unlikely to create much in such a crowded, tight box. Despite this Spurs still created 17 chances and we’d expect them to have scored 2 goals. As you can see in the tweet at the start. As you can see in the tweet at the start Ben Davies created most of Spurs’ chances. Southampton weren’t as deep as the other two video clips. This led to poor defending as Alli and Kane both made runs into the box against one defender and could have got free headers. The positioning of the other defenders is odd and Romeu should have tracked Alli’s run into the box better or Stephens should have been more central rather than drifting towards the ball. Southampton set deep and had 2 organised, compact lines. There is limited space between the lines. However, in this example Alli and Son are both between the lines. In this shot all eight Southampton players in shot are facing their goal. Stephens and Hoedt both have their backs to Alli and Son. There’s a danger of either of them making runs and the Saints defenders being slow to react. With every player facing their own goal there is little pressure on Ben Davies. The Southampton defence is retreating and happily conceding space to Spurs, allowing them a lot of time. Southampton effectively counter attacked throughout the match. 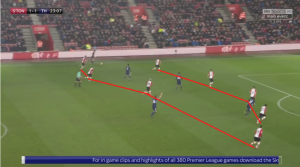 After breaking up Tottenham’s attacks Southampton played a through ball into wide areas to take advantage of Spur’s unorganised defence. They used the pace of Boufal and Tadic in wide areas to counter attack 7 times throughout the match. Bertrand was a contant threat down his flank. He made several fast, powerful overlapping runs. Tadic regularly used him as an option. Ryan Bertrand was able to distract Aurier and get in behind the Tottenham back line from full back. It even lead to Southampton’s goal, which you can see below. James Ward-Prowse also created this great set piece. It is a perfect in-swinging cross which Stephens should have done better with. Both teams needed three points. However, Tottenham will see it as two points dropped. Whereas Southampton can be content with a point against a top 6 team. Saints fans are rightfully worried about their current form. They’ve dropped into relegation zone. Relegation to the Championship could really damage the club and its renowned youth system. Also, this match brought Harry Kane’s 99th Premier League goal. An impressive feat for a 24 year old to be so close to his century. Sean Dyche’s Burnley over-performed so far…is their defensive approach sustainable?